ICYMI, Sydney (of course) now has a capsule hotel and if you’re not sure how you feel about it, I don’t blame you, because I wasn’t either. But in the interest of giving you guys the full run down on everything that Sydney decides is a good idea, I gave it a go, and this is what happened. I arrived out the front of Bar Century, clutching my overnight bag and trying to keep my fear of a claustrophobic panic attack at bay. I had already talked one of the girls from the office into joining me for an all you can eat pizza feast and a couple glasses of wine before arriving, so I was probably in the best mental space to deal with my capsule experience. I trekked up the many flights of stairs (okay, okay, three) to the Capsule Hotel and was pretty pleasantly surprised if I’m honest. 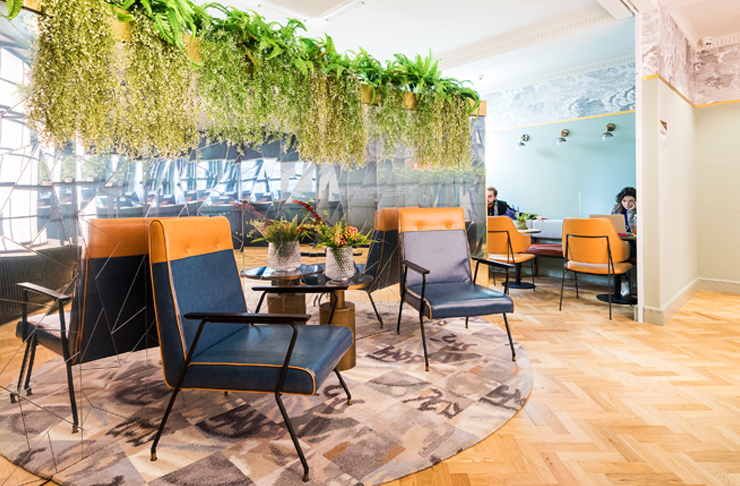 The fit out is modern, with comfortable sitting areas, a clean communal kitchen space and friendly guy behind the counter who gave me a quick run down on how to use the TV remote in my capsule (because priorities). I headed up another two flights of stairs to the top floor and if I’m being totally honest, aren’t I always, I struggled to use the key card to enter my room—let’s just say that was my fault and not theirs. To get to your pod you have to go through a security door to your level, then another to your “room”, THEN swipe to get into your pod—so yes, it’s pretty damn secure. But now onto the reason that you’re all here—the actual capsule. 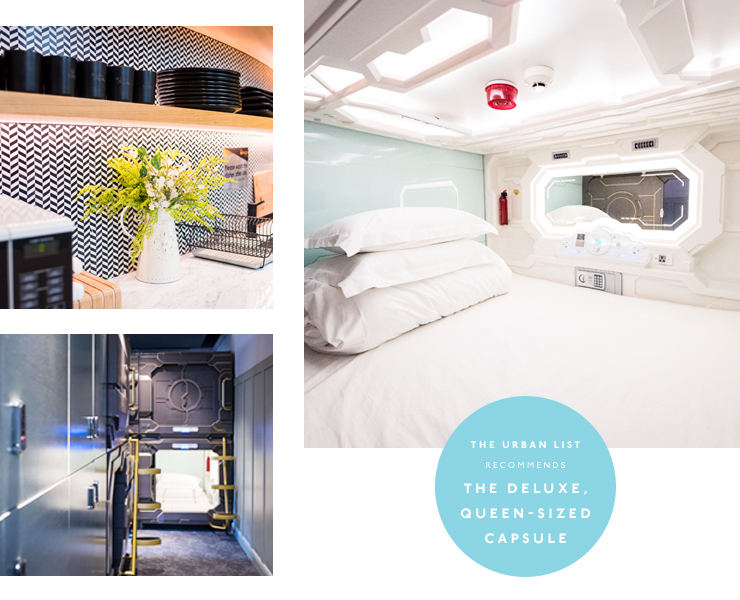 I was in one of the deluxe, queen-sized capsules and would definitely recommend that you spring for one, because firstly, you deserve it and secondly, there’s actual space where you can fit your bag in there with you. This is important when you’re ten minutes in and have already made ten awkward trips out of your capsule to grab your phone charger, bottle of water, and some cheeky fresh air. You’ll want your creature comforts by your side. The capsule itself is downright futuristic, with a mirror down the side panel, a vault-like door, and buttons and knobs all over the place—these guys are for crucial functions like turning the lights on, controlling the volume on your TV and locking the door to your capsule (because, you know, safety). My second hot tip is that you use the bathroom first, before heading into your capsule with your bag, because you’ll instantly want to snuggle under your doona, binge-watch the latest episodes of The Bachelor and take a snooze. The bottom line on The Capsule Hotel is that it’s a great alternative to a hostel dorm, particularly if you don’t relish the thought of rolling over in your bunk and making awkward eye contact with your neighbour as you both try to fall asleep. Obviously, we all want to be living that 5-Star life, but let’s be real, that’s not necessarily in the budget if you’re travelling to Sydney as part of a round the world trip, now is it? That brings me to my very wise, third and final nugget of wisdom: bring an eye mask and earplugs, just to up the comfort factor that little bit more. If you'd prefer to just deck your house out in plants, read this.